where γ is an interaction constant which taken as constant in the original ANM. si,j is the instantaneous distance between nodes i and j. For more advanced reading about the theory behind the model and its applications see references 11,12. The current version (ANM 2.1) of this web site is built to be used with proteins and nucleic acids. Other ligands which exist in the coordinates file may also be included. For proteins and nucleic acids the site suggests default nodes (Ca for amino acids, P, C4', C2 for nucleic acids), while for non-tandard liagnds the user need to manually chose nodes and interaction cutoffs if she wishes to include those in the model. For full functionality, the size of the protein should be up to 1500 residues. For such structures the calculation of 20 dominant modes is performed within seconds. The calculation of the theoretical B-factors based on all the modes is done within 2 minutes. The analysis pages could appear in a delay, depending on the communication speed and the memory of the client computer (downloading large result files to the user machine), but will not appear within more than a minute or two for such moderate-size proteins in any case. For larger proteins some problems with the graphics are expected. The calculation of the b-factors might take longer. The dominant modes calculation, however, will be performed and text files with the results will still be available within few minutes. The site was tested with proteins up to 2000 residues. For structures with more nodes expect functional problems. Note that the JSmol applet on the main interface page could be slow for large structures, as the coordinates file (which should include a frame for each normal mode) becomes huge and causing memory issues. The graphic pages that appears under the create PDB files option might behave better because only information about individual modes is saved in the memory at each time. Version 2.1 from Oct 2016 is different from version 2.0, which was described in the 2015 Bioinformatics application note, by several techinal aspects, in particular the introduction of JSmol instead of Jmol for visualization. This change makes the site much less platform and browser dependent. No external installations of Java plugins is needed. This site uses BLZPACK (6) and Matlab (9) for calculating a subset of eigenmodes. The default value is 20 modes but this number can be changed in the input page. If the number of requested modes is different than 20, the user should choose matlab as the eigensolver. The site calculates and report the slowest modes. BLZPACK is a Fortran 77 implementation of the block Lanczos algorithm for the solution of the eigenvalue problems. It was originally intended to solve large, sparse, generalized problems which makes it very appropriate for the use here. In Matlab we use the eigs function which is the Matlab interface to the ARPACK package. The server calculates a subset of the eigenpairs and not all of them. This is sufficient since we are usually interested in a small set of eigenpairs corresponding to the smallest eigenvalues ("slow modes"). The eigen decomposers use extremely efficient algorithms (6). For molecules with 300 residues (900×900 ANM Hessian matrix); the solution is obtained within 2 seconds and for structures with thousands of nodes it is typically obtained within few minutes. JSmol (7) is a free code molecular graphics tool which can be used in both HTML5 and Java modes. It was chosen to provide the graphics for this site as the code is actively and rapidly developed, and since it was originally designed to support visualization of vibrations. This support includes the option for animation of all vibrational modes in one session with only button click required to switch between the modes. Directional vectors can be presented for easy visualization of the direction of motion at each mode. Anisotropic parameters, a direct product of the ANM results can also esaily displayed using JSmol. Detailed documentation and description of JSmol capabilities are available on the Jmol site. In general, many options can be controlled by the mouse from the pop up menu (right mouse click on the applet). Other options are available by command line scripting language which is highly compatible with the traditional RasMol scripting language (open the "console" option from the pop up menu to execute commands). For several options which are directly related to the vibrations and for some important visualization features we built a control panel for the user which will be described. We highly acknowledge the work done by the Jmol team that allow us (and other) to present sophisticated data in a convenient and quality graphical environment. JSmol can be run in the HTML5 mode in essentially any platform and web browser. In recent years several security problems with Java applets gradually limit the usgae of the Java mode in different platforms and browsers. We suggest here solutions to some of the problems. Matlab (9) is also used for matrix manipulations and a fast calculation of theoretical B-factors based on all the modes using the eig function. Perl modules are applied for cgi web programming and drawing of graphs and figures. C code is used for parsing of structures and calculation of the Hessian matrix. The Matlab and Perl and the C codes are available upon request. The C codes for local ANM calculations and constructions of Hessian matrix is available here. Specification of a 4 letter code PDB ID. The user can choose by a checkbox if to use the original PDB coordinates (default) or the putative biological unit suppled by the PDB. The latter should reflect better the biological multimeric state of the protein. Uploading of a coordinates file from the user computer to the server. The user should determine if she wishes to include all polypeptides chains in the calculation (default) or only individual chain. In the latter, a chain ID (usually a Latin letter A,B etc.) should be specified on the appropriate text field in the input page. An input chain symbols such as "*", " " , "-", "_" , "0" will cause inclusion of all polypeptide chains in the calculation. In addition, the user can define which models will be included in the calculation. Models are often (but not always) used to include alternative conformations in the file. The two most frequent situations in which the coordinates file include different models are NMR files and files with the biological unit information. In the first case the user should choose which of the models in the file (usually marked as integer numbers) should serve as the equilibrium state for the calculation. In the second case the user should probably specify "all" in the text field for model as all the coordinates in the file (even those found under different models) are part of one biological unit. In the basic input page the user has control over two parameters in the model. The first is the cutoff which defines the maximum interaction range between Cα atoms. Fig. I shows the performance of the model (in terms of correlation with the experimental fluctuations) for a range of cutoffs. 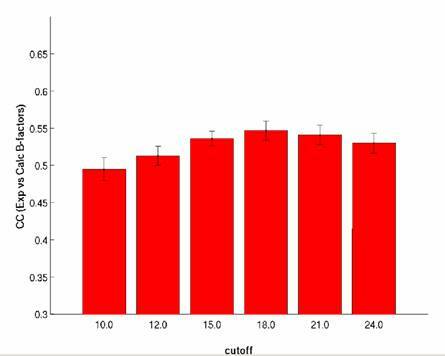 It can be clearly seen that on average for globular proteins the best results are obtained for cutoffs of 15-21Å. For individual proteins, however, for example extended proteins or membrane proteins, smaller cutoffs maybe preferred. Smaller cutoffs, in the range of 12-15Å, give results better ressembling anisotropy values found experimentally (Eyal et al., 2007). It should be also noted that calculation with larger cutoffs are slower (the Hessian matrix is less sparse). Combining all those reasons we chose the default value of 15Å for distance cutoff in the ANM server. The second parameter is the distance weighting factor (Eq. 5,6). Large scale statistical analysis indicates the best value for this parameter is 2.5. Using this value the correlation between theoretical and experimental b-factors are better by 4% comparing to the original ANM from about 55% to about 59%. When running with p=0 (default), the original non-weighted ANM is executed. The "number of modes" parameter determines how many dominant normal modes will be calculated. More modes give more compleate picture on the dynamics of the system in the cost of computational time. 20 modes are usually sufficient to describe the important motions of small-medium systems as the slow modes are usually the functional ones. Since version 2.0 of the ANM website, we allow now more sophisticated control over the run parameters. These optional parameters should be provided from the "Proceed with advanced input options button" in the bottom of the input page. The user can control the identity of the atoms which will serve as nodes in the network. For proteins, the Cα atoms are the default nodes, but the user can change to other backbone atoms if needed. For nucleic acids, the default setting is that each nucleotide will be represented by 3 nodes. By default each nucleotide is represented in the network by three nodes, positioned at the P atom of the phosphate group, C4' in the base and C2 in the sugar ring. This model has been shown (Yang et al., 2006) to have superior predictive abilities, based on the comparison with experimental B-factors using 64 oligonucleotide/protein complexes (13) and on case studies such as the application of ANM to the ribosome (14). The server provides the option of adopting different number and types of user-defined atoms for representing the nucleotide nodes. All backbone heavy atoms of the protein and all the nuculeotide atom types are listed and can be selected as nodes. Small ligands can also be explicitly included in the ANM analysis. Ligands, if present in the PDB coordinates file, will be automatically parsed and listed and their atoms will appear in separate a list. Each atom from this list can also be selected by the user as a network node. To support the above changes, the server applies now a new strategy that enables flexibility in the definition of network nodes and cutoff distances of interaction. The cutoff, rc depends on the identity of potentially interacting atoms i, j. For each atom type i, an associated distance range of interaction, ti, is assigned. For each pair of atom types i, j the cutoff distance rc is defined as ti+tj. This definition implies that the number of parameters in the system is bound by the number of different atom types. In the simplest case where we want a unified threshold distance rc for all atom types, as in the traditional ANM, we simply assign ti = rc/2 for all atom types we would like to include. The server suggests rc=15 as default setting. Slow Eigenvlaues (oanm.eigvals) : Lists the N smallest eigenvalues. The 6 smallest eigenvalues should be roughly zero. Starting from the seventh, the eigenvalues are related to the vibrational frequencies (proportional to the square root of the eigenvalue) and to the contribution to the magnitude of fluctuations (proportional to 1/eigenvalue). X components of slow eigenvectors (oanm.slwX) : List the X axis component of the N eigenvectors (a column to each vector) which correspond to smallest 20 non-zero eigenvalues. Y components of slow eigenvectors (oanm.slwY) : List the Y axis component of the N eigenvectors which correspond to smallest N non-zero eigenvalues. Z components of slow eigenvectors (oanm.slwZ) : List the Z axis component of the N eigenvectors which correspond to smallest N non-zeroeigenvalues. Normalized slow modes. Fluctuations of residues in each individual mode (oanm.slwmodes) : The normalized self fluctuations (the norm of each vector is 1) for each residues in each mode (a column to each mode). The first column is the residue index. Hessian matrix in a coordinates (sparse) format (oanm.hes) : The Hessian calculated according to Eq. 3 or 6. The Hessian is brought in a format i, j, value. In the original matrix H we have H[i][j]=value, H[j][i]=value. Zero entries in Hessian are not listed in this file. Theoretical and experimental b-factors (oanm.bfactors) : Includes the theoretical and experimental B-factor (temperature factor). The first column is the residue index, the second is ANM calculated theoretical B-factors and the third is the x-ray crystallographic b-factors taken from the PDB file. Correlation between theoretical and experimental b-factors (oanm.corr) : Pearosn's correlation coefficient between theoretical and experimental b-factors. Estimated value of spring constant (oanm.gamma) : Based on the difference between the experimental and calculated b-factors, it is feasible to calculate the structure-specific spring constant (gamma). Gamess file (protein.out) : See description in the section below. XYZ file (protein.xyz) : See description in the section below. Coordinate files in PDB format for individual mode fluctuations : PDB files for individual modes can be constructed. The files include set of models that describe the fluctuations in this mode in a linear sequence. These files can be downloaded and read by any application capable of showing show/animate PDB structures. The user controls the amplitude of the fluctuations and the number of frames in the animation (related to the smoothness of the motion in the animation). Note that the animation should be performed in a palindromic fashion and not in a loop fashion (the first frame and the last frame are in two extremes of the fluctuations). Coordinate files in PDB format with anisotropic temperature factors: The model predicts also the magnitude of the fluctuations in each individual axis and the covariance between the fluctuations in the different directions. These are directly related to the anisotropic temperature factors sometimes reported in the protein data bank. The vaules of the anisotropic factors can be based purely on the theoretical results of ANM, or they can be scaled according to the experimental b-factors. This scaling improves significantly the prediction of the mean square fluctuations in the X, Y, Z directions and slighly the correlation between the motions in the different directions. Gamess file : This file includes the input coordinates and the most significant eigenvectors (20 by default). The format of these sections is according to Gamess (10) file format. This file is also readable by Jmol. XYZ file : This file includes the input coordinates and the most significant eigenvectors (20 by default). The format is: atom,x,y,z,xvib,yvib,zvib and the structure is therefore repeated according to the number of normal modes calculated. Modes: Visualization of the slow modes calculated. The fluctuations of the selected mode appear and the molecule is colored according to the self-fluctuations. Red colors correspond to large fluctuations and blue colors to small fluctuations. By default, the vibrations in the first mode are animated and the residues are colored accordingly. Frequencies of vibrations : The default state of the analysis page presents the vibration frequencies of the different modes in the same proportions as the real frequencies. The user, however, can change the frequency for each mode using the pulldown menu for the purpose of visualization or analysis. In this case the proportions between the vibrational frequencies of the different modes are not realistic any more (the change is valid only to the mode where it was applied). The visualization frequencies (in Hertz units) are, of course, the vibrational frequencies as appear on the screen and not the real vibrational frequencies of the molecule, which are orders of magnitudes larger. Amplitude of vibrations : The amplitude of the vibrations can be changed by the user to emphasize the motion or to observe minor fluctuations that can not be distinguished otherwise. It is important to note the model does not always accurately represents the real size of the fluctuations but only the relative amplitude between the residues. Vectors : Vectors represent the direction of motion of each residue in each vibrational mode can be shown or hidden by checking on the vectors check box. The user can change the color of the vectors, their width and their length. Display : The size of individual atoms (space fill) and the width of the bonds (wire frame) can be controlled by the pulldown menus in the graphical user interface, in addition to the available built in options in Jmol. If for some reason the desired action is not performed, try to click on other value in the same pulldown menu and then press again on the initial one. Another possibility is that not all atoms are selected. From the Jmol menu (right click on the applet area) choose "select all" and then try again to perform the action. Labels : Residues can be labeled by their type and their number in the coordinates part of the PDB input file. Individual atoms can be labeled, as well as all atoms. The clear option in the menu remove all the labels. Note that the regular labeling options of Jmol will not be functional with this file format. Colors : The protein can be colored by the polypeptide chains, by the experimental temperature (b) factors and by the fluctuations in each individual mode. The coloring scale is red-white-blue, where red indicates larger fluctuations. The coloring mode chosen from this pulldown menu is disconnected of the display method or the vibrational mode, so potentially we can have the residues vibrate according to one mode but colored according to a different mode. However, if the "Modes" option is changed, the coloring scheme changes automatically to that of the selected mode, although this might not be reflected in the coloring menu. ANM model : Shows the network of the interactions for 10.0Å cutoff. Chain connectivity : Color each polypeptide chain in different color and shows only the trace of the chains with no other non bonded interactions between sequentially distal residues. Because of the poor annotation in this file format, the Jmol built-in menu does not support equivalent options. The chain connectivity option may take some time to be executed for large proteins. Snapshot : Since there is no direct way to save images from the JSmol applet in the Java mode, we added an option to easily capture the screen and save the image in JPG format. Note that in the HTML5 mode there is an option from the "File" submenu of the popout menu of JSmol to save images in different formats including JPG, PNG and GIF. Self fluctuations and b factors as a function of residue index : The graph presents the fluctuations of individual residues according to experimental b-factors (or mean square fluctuations in NMR structures), according to the normalized values (in units of standard deviations from the mean), according to the calculated mean squared fluctuations or according to the fluctuations in each individual mode. For each polypeptide chain a separate graph is given. A single parameter or any combination of the above parameters can be chosen for the display. The graphs (in .png format) can be downloaded. The residue numbers on the X-axis are taken from the coordinates part of the PDB file. Correlation analysis by two dimensional matrices : The web site offers elaborated options to explore the correlations in fluctuations between residues. The user can choose to explore the correlations between residue pairs in each individual mode. In addition, a range of modes (within the first 20) can be given and then the correlation according to the sum of all the modes in this range is obtained. A correlation based on all modes can also be obtained. Initially, when linking to the covariance page from the main interface page, a correlation matrix based on the first mode is shown. Using the options in the lower-left frame the user can choose to analyze a different correlation matrix as described above. The structure in the upper-left Jmol frame vibrates in the same mode as that of the correlation matrix . If a range of modes is given, the structure vibrates in the lowest mode in this range. The color scheme of correlation matrix in the right frame is such that correlated residues are colored by red and anti-correlated residues are colored by blue. Weak correlations appear in light colors. Each cell in this matrix is a hot link to a 10×10 matrix which zoom in to this region in the matrix. For big proteins this allows an analysis of each pair, which is not feasible in the resolution of the large matrix. Moving the mouse over of the cells of the small 10×10 matrix, boxes appear which give information about the correlation value as well as the distance between the residues (the Cα atoms).&bnbsp; This matrix is also "hot". Clicking on each cell will highlight the residues on top of the structure in the Jmol frame. In ANM 2.0 we added an option to navigate directly from this small matrix to the adjucent four neighbouring sub-matrices using arrows, without going through the large matrix. The colors of the residues in the Jmol frame are the same as those on the correlation matrix and indicate the degree of correlation between the residues. The correlation matrices are standard figures in a .png format and can be downloaded from this page. The color scheme of matrix is such that large inter-residue fluctuations appear as blue and small fluctuations as red. Each cell in this matrix is a hot link to a 10×10 matrix which zoom into a sub-region in the matrix. For big proteins this allows an analysis of each pair, which is not feasible in the resolution of the large matrix. Moving the mouse over of the cells of the small 10×10 matrix, boxes appear which give information about the fluctuation value as well as the equilibrium distances (between Cα atoms). This matrix is also "hot". Clicking on each cell highlights the residues on top of the structure in the Jmol frame. In ANM 2.0 we added an option to navigate directly from this small matrix to the adjucent four neighbouring sub-matrices using arrows, without going through the large matrix. The colors of the residues in the Jmol frame are the same as those on the square distance fluctuations matrix. The matrices are figures in a .png format and can be downloaded from this page. A graph of deformation energy for each residue shows the potential energy of the residue considering all the interactions ("springs") in which it takes part. For each residue all the entries in its row/column matrix for which there is an interaction (based on the user's cutoff) are summed up. The number bellow the graph shows the ovewrall energy of the system. According to the equipartition theorem the overall interanl potential energy of the system in each independent mode is constant and equals to KbT/2 (around 0.3 Kcal/mol at 300K). Eigenvalues : A figure with the distribution of the 20 dominant eigenvalues is shown. This allows for a quick visual inspection for the relative contribution of each mode and possible degeneracy between the modes. A problem with the functionality of the site on Mac computers may still exists. Some of the options, involving interactions with the Jmol applet using a graphical user interface, are not working on most browsers. Other options are still functional and the text files holding the computational results are available in any case. Delays in the calculation of B-factors and correlation matrix based on all modes. Since these options essentially requires more heavy computations the results might appear in delay comparing to the other data. Options at the main graphical user interface are sometimes not responding well. If an action chosen from the pulldown windows is not performed, try to click on other value in the same pulldown menu and then press again on the initial one. It is also possible that not all atoms are selected. From the Jmol menu (right click on the applet area) choose "select all" and then try again to perform the action. If the motion is very slow and the applet does not responds well, most likely the molecule is very large. You may try to use the site with a computer with larger memory. (1) Dynamics of proteins predicted by molecular dynamics simulations and analytical approaches: application to alpha-amylase inhibitor. Doruker, P, Atilgan, AR & Bahar, I. Proteins 40, 512-524, (2000). (2) Anisotropy of fluctuation dynamics of proteins with an elastic network model. Atilgan, AR, Durrell, SR, Jernigan, RL, Demirel, MC, Keskin, O. & Bahar, I. Biophys. J. 80, 505-515, (2001). (3) Computational prediction of allosteric structural changes by a simple mechanical model: application to hemoglobin T to R transition. Chunyan, X, Tobi, D & Bahar, I. J. Mol. Biol. 333, 153-168 (2003). (4) Global ribosome motions revealed with elastic network model. Wang, Y, Rader, AJ, Bahar, I & Jernigan RL. Structure. 147, 302-314 (2004). (5) Relating molecular flexibility to function: A case study of tubulin. Keskin, O, Durell, SR, Bahar, I, Jernigan, RL, Covell, DG. Biophys J. 83, 663-680 (2002). (7) oGNM: Online Computation of Structural Dynamics Using the Gaussian Network Model. Yang, LW, Rader, AJ, Liu, X, Jursa, CJ, Ching, SC, Karimi, H & Bahar, I. Nuc. A. Res. In press (2006). (10) General Atomic and Molecular Electronic Structure System. Schmidt, MW , Baldridge, KK, Boatz, JA ,Elbert, ST, Gordon, MS, Jensen, JH, oseki, SK, Matsunaga, N, Nguyen, KA, Su SJ, Windus, TL, Dupuis, M & Montgomery, JA. J.Comput.Chem. 14, 1347-1363 (1993). (11) Normal Mode Analysis: Theory and Applications to Biological and Chemical Systems (2006) Mathematical Biology Series, CRC Press. (12) Elastic network models for understanding biomolecular machinery: from enzymes to supramolecular assemblies. Chennubhotla, C, Rader, AJ., Yang, LW, and Bahar, I., Phys. Biol. 2, S173-S180 (2005). (13) oGNM: Online computation of structural dynamics using the Gaussian Network Model Yang, LW, Rader, AJ., Liu Xiong, Cristopher Jon Jursa, Chen, SC, Karimi, HA and Bahar, I., Nucleic Acids Res. 34, W24-W31 (2006). (14) Global ribosome motions revealed with elastic network model assemblies. Wang, Y, Rader, AJ, Bahar, I, Jernigan, RL., J Struct Biol. 147, 302-314 (2004).